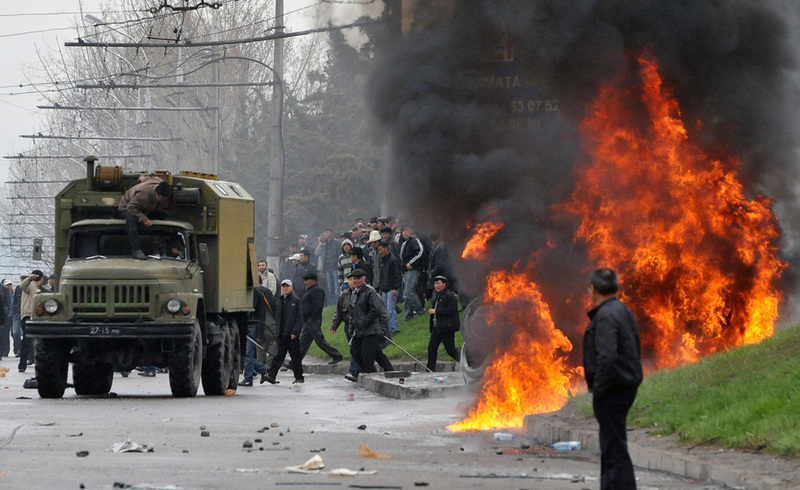 Oleg, what about the main question: Are these riots encouraged/supported by the Kremlin? This “revolution” is symptomatic of third world countries in that, it merely replaces one corrupt regime with another. As soon as the new strata of bureaucracy is installed and consolidated it’s power it will probably revert to the “old” leadership’s methods of government until the next wave of revolts and so on. This particular event has little relevance to Russia, but it may be telling in regard to the future of other republics which could play a bigger role in the destabilization of Putin’s regime. The ultimate scenario would be riots in republics which border with Russia with the hope of stirring up the autonomous republics of the Russian Federation and instigate a secession of those republics from the RF. The above process is plausible upon steep economic crisis (or a few consecutive crises) which will inevitably occur at some point. What do you think about Ryzhkov’s view, he disagrees with you according to MT? LR, I don’t know who was behind this riot. People are talking about a “Kremlin’s hand,” but I haven’t seen any proofs yet. Medvedev effectively praised the rebels, which is very strange given his and Putin’s attitude toward most opposition movements in Russia and abroad. But it doesn’t necessarily mean that Moscow orchestrated this coup; they could just realize that Bakiyev was done and that they should support the winning side. As for Ryzhkov, I agree with his idea that Russia should have intervened–as a mediator of the conflict, not as a side. They could reduce casualties and help stop violence at both sides–like European delegates did in Ukraine in 2004 and Russia’s own Igor Ivanov did in Georgia in 2002. But our government seems to be very bad at soft power. Good thing is that they didn’t at least send their spetsnaz to help one side. Glad to see another coloured project fall, they all eventually do. The farce cannot be played indefinitely. As much as I hate Iliescu, I don’t think it’s fair to insinuate that going from Ceaușescu to Iliescu wasn’t worth the bloodshed. I wasn’t living in Romania at the time, but from what I understand, Iliescu was terrible, but Ceaușescu was a million times worse. Georgians are not alone in their fears for a peaceful development of their nation. President of Belarus Alexander Lukashenka, whose quarrelling with the Russian leadership has only intensified recently, was the only leader to openly call the Kyrgyzstan events an “anti-constitutional coup d’état.” “Bakiyev did not know what to do…He was the leader of a very poor nation…Russia first promised him money but then refused to give.” The Belarus leader was apparently hinting at the manipulations to which the ex-Kyrgyz president was subjected by the Russians. It is only ironic that the Russian president named corruption and clans as maladies that determined Bakiyev’s fate. Russia’s record in those categories is arguably no better than Kyrgyzstan’s. While Belarus is doing much better in those terms and Georgia is the clear champion in the post-Soviet space as the least corrupt country with the freest economy, they nonetheless cannot expect to be praised by Medvedev or his prime-minister, Vladimir Putin. For the Kremlin, it is the sovereignty issue in the post-Soviet states that matters most and, besides, Russia has not yet come close to the point where it could teach other nations how to live in modernity without corruption and nepotism.